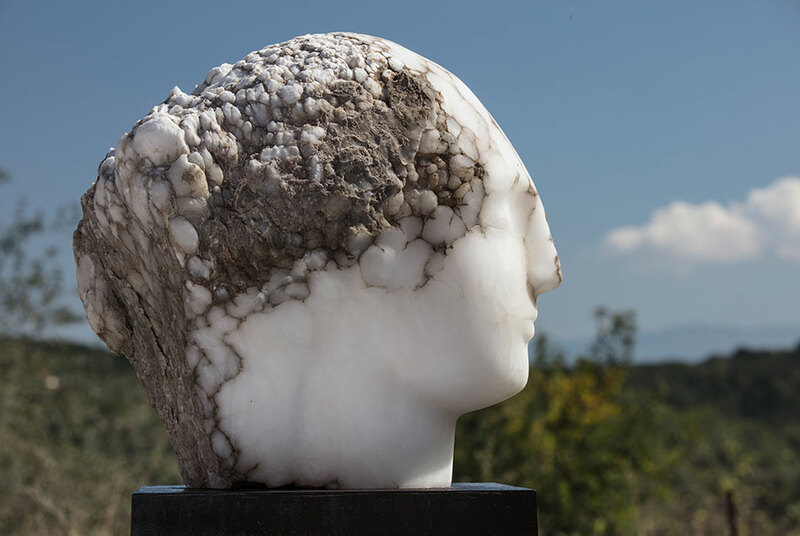 Emily Young, Cloud Head V. Tuscan Alabaster. Unique. Height: 14 1/2" (37 cm). Conceived and carved in 2017. LONDON.- Bowman Sculpture is presenting a solo exhibition of new works by Emily Young, widely regarded as Britains greatest contemporary stone sculptor. The exhibition includes a new series of heads, discs and torsos carved from stone and rarely seen bronze works. Young is recognised for her sculptures and public artworks that investigate the relationships between the ancient world and our own; humankind and the natural world and an artwork and its origins. She continues to explore a connection between time, land and cultures through her deeply personal approach to sculpture. Her work is a direct manifestation of the human consciousness, allowing her to carve, for example, a human face directly onto a piece of stone which in turn marks her relationship to nature. Through a profound engagement with each individual stones geological history and its geographical source, Young forms a personal dialogue with the past and the future. Youngs studio in Tuscany is situated in a 17th century monastery located between the Ligurian Sea and Mount Amiata, a mountainous volcanic area inland, the area is rich in natural, cultural and historic significance. She sources her materials locally in Italy and across the world. Young demonstrates the extraordinary qualities of stone, allowing the material to convey profound messages about life, time and the universe. For this exhibition the artist has carved works from stones ranging from Indian Forest Green marble, white onyx, Rouge de Vitrolles, Quartzite and Dolomitic limestone among others. A rich variety of attributes characterise each type of stone and therefore each work. Agate, for example, is characterised by its fineness of grain and brightness of colour whereas Kilkenny marble is a fine-grained Carboniferous limestone that contains fossils thus revealing the preserved traces of animals, plants, and other organisms from the distant past. The artists approach is to work with the stone, allowing the material to reveal its inherent beauty. Young arrives at the finished work through a process of carving that guides the artist according to the unique character and traits of the material. Young says: the grace, power and pleasure that the natural world can show us is what drives the making of these pieces. The human form, the most complex of all life forms on earth, is carved out of stone, out of the same minerals, elements, atoms and molecules that have always made up our physical universe. She continues: throughout my working life as an artist, the connections, or lack of them, between humankind and the astonishingly rare and precious natural world has been the predominant story. Really its the only story now, the biggest story of all tim e for humanity. Emily Youngs work has been widely exhibited throughout the UK and internationally with select solo exhibitions including at St James Church, London (2017), the cloister of the Madonna dellOrto church in Venice (2015), Berkeley Square Gardens, London (2014), Pallant House Gallery (2014), Bourne Fine Art, Edinburgh (2012), The Fine Art Society (2011) and St Pancras Church Crypt (2006). Select group exhibitions include Chatsworth House, Derbyshire (2016), David Roberts Art Foundation (2015), The J. Paul Getty Foundation, California (2013) and The Space, Hong Kong (2012). Young won the commission for eight stone sculptures for Salisbury Cathedral on the occasion of the buildings 750th anniversary celebrations in 2008. Permanent installations, public and private collections include: The Imperial War Museum, London; Paternoster Square (Saint Pauls Cathedral), London; Kew Gardens, London, Salisbury Cathedral; La Defense, Paris; University of Notre Dame, Chicago, USA, The Whitworth Art Gallery, Manchester. Young was born in London in 1951 into a family of writers, artists, politicians and adventurers. Her grandmother was the sculptor Kathleen Scott, a colleague of Auguste Rodin and widow of the explorer Captain Scott of the Antarctic. The artist currently divides her time between London and Italy. She is represented exclusively, worldwide, by Bowman Sculpture.